I just got home from a very fun trip to the craft capitol (IMO) of the world...Utah. My main goal, other than visiting my family was to shop and hit as many craft and decorating stores as possible. And boy oh boy, shop we did!!! A bad picture from Rodworks. 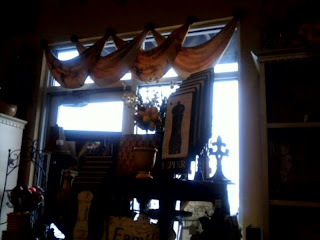 My mom took this picture of the cute window dressing. It's swags of fabric hung from drawer pulls. It was ADORABLE. Everything about this store is adorable and I wanted everything! Love the carrots. They are orange gauzy fabric with raffia inside. Soooo cute! They were hung off the side of a shelf with a length of ribbon. Buckets were also hanging from the ribbon. Again, soooo cute! These pictures are both from Tai Pain. I LOVE the hanging frames with ribbons, glass jars and all manner of Spring fun stuff hanging from them. We also went to Roberts Crafts, Real Deals, the Quilted Bear, Archivers and IKEA. Oh, my other goal was to eat as much as possible.